The levels of violence in prehistoric times (archeological evidence) and in non-state societies (ethnographic evidence) was much higher than in modern state societies and in the world today. This is what the data tells us, and I have visualized this evidence in a series of barcharts. Homicide rates for modern times are routinely published by statistical offices or other state agencies, and research institutes publish reliable data on war deaths. For the study of lethal violence in non-state societies we have generally two different sources of information; for the more recent past (since the late 19th century) abundant ethnographic evidence is available. For the more distant past, we have information on the prevalence of violence from archeologists who have studied violence in past societies by studying archeological sites and skeletal remains. They present data on the share of people that died in violent conflict with other humans in scientific studies. Data from both archaeological and ethnographic studies is presented in the dataset on this website, but it is not all the information we have on violence in different societies. Non-quantitative information on violence is abundant; for example through forms of art. I have collected data on violent deaths; the long list of sources can be found below. These data show that in prehistoric times (archeological evidence) and in non-state societies (ethnographic evidence) the levels of violence was much higher than in modern state societies and in the world today. 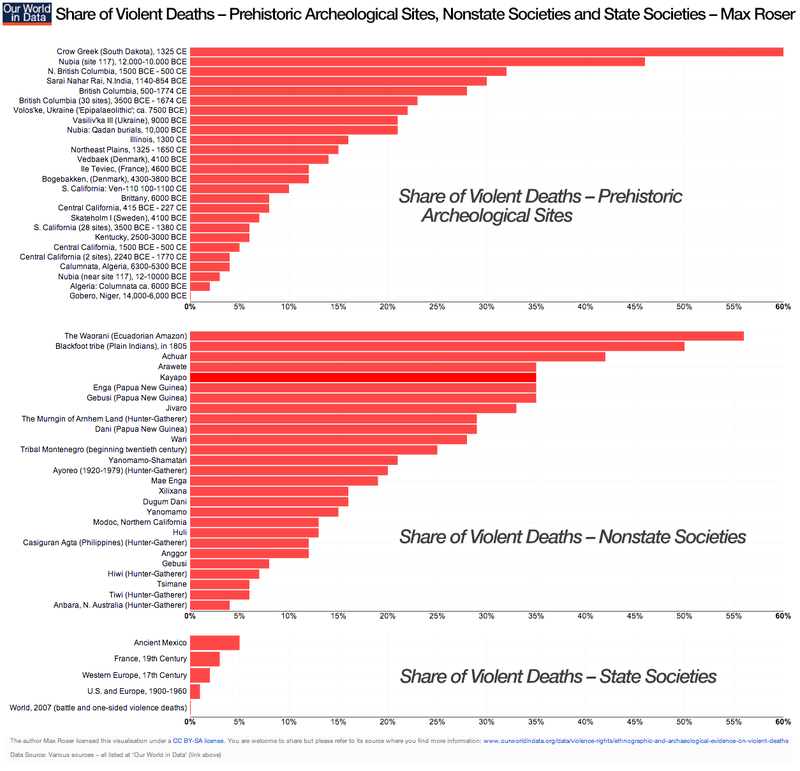 Download the image of the barcharts showing &apos;shares of violent deaths in prehistoric archeological, state and non-State societies&apos;. 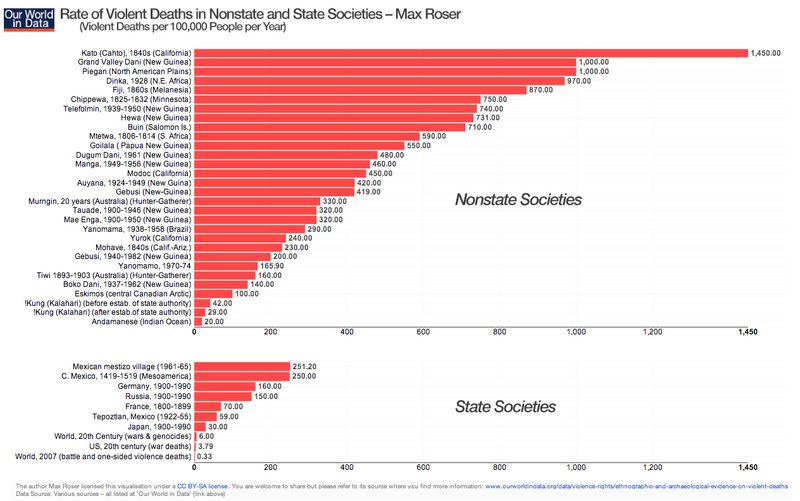 Download the image of the barcharts showing &apos;rates of violent deaths in state and non-state societies&apos;. There are two ways to state the frequency of homicides in populations: rates and shares. For modern societies, homicide rates are usually given as homicides per 100,000 people per year; for more violent societies described by archeologists and ethnologists, homicide rates are sometimes presented in homicides per 1000 people per year. Homicide shares are simply the percentage of a sample of deaths that were due to homicide. The word &apos;war&apos; evokes the image of large scale battles; indeed the modern literature considers an armed conflict to be a war &apos;if at least 1,000 battle or battle-related deaths are inflicted in the indicated year&apos;.11 It is important to make clear that the aforementioned association of the word and the modern definition are not applicable to lethal conflicts among small societies. What is common to both the definition of warfare among small and large societies is that the conflict is fought between different groups of people. One drawback of my database is that it was not always possible to distinguish between violence killings inflicted by members of the same groups and killings inflicted by members of a different groups. In small societies without a state authority, the violence between different groups is typically higher than among members of the same group. The reason why this distinction is hard to make is obvious for archeological evidence. For data based on ethnographic studies, I commented on the distinction between inter- and intra-group killings. Nevertheless, this dataset would be improved if the distinction would always be made. To make comparisons between levels of violence, I calculated the homicide shares and rates for modern state-societies by also including killings in both intra-group wars and inter-group homicides. This is the collection of all my sources for data on ethnographic and archaeological evidence on violent deaths. This data is presented in the entry on homicides. The starting point for my research was the sample presented by Pinker (2011).12 Pinker does not present the numerical data itself but instead includes two bar charts (Figures 2-2 and 2-3) from which the exact data cannot be discerned. Therefore I looked up all the sources for the data he presents. The topic of Pinker&apos;s book is the decline of violence in humanity&apos;s history. That would give him an incentive to cherry-pick data that suits his narrative. For this reason I had contact with several of his critics and asked them for their evidence. After this assessment of Pinker&apos;s data, I did not find any reason to assume that he cherry-picked. He included all the data that his sources included. Through my contact with critics of Pinker&apos;s book I was referred to a critique of Pinker&apos;s data by Douglas Fry.13 Fry criticizes some of Pinker&apos;s data. I checked the original sources for the criticized information, referred to the criticisms and the original sources in my comments and corrected the data when the criticism was justified. Bowles (2009) - Did Warfare Among Ancestral Hunter-Gatherers Affect the Evolution of Human Social Behaviors?. In Science, 324, 5932, 1293--1298. Gat (2008) - War in Human Civilization. Oxford University Press, USA. Knauft, Bruce M. et al (1987) - Reconsidering Violence in Simple Human Societies: Homicide among the Gebusi of New Guinea. In Current Anthropology, 28, 4, 457-500. Keeley (1997) - War Before Civilization: The Myth of the Peaceful Savage. Oxford University Press, USA. Pinker (2011) - The Better Angels of Our Nature: Why Violence Has Declined. Viking. Walker and Bailey (2013) - Body counts in lowland South American violence. In Evolution and Human Behavior, 34, 1, 29--34. Source that my source quoted: Heider, K. 1970. The Dugum Dani. Chicago: Aldine. Source that my source quoted: Livingscone, F. 1968. "The Effect of Warfare on the Biology of the Human Species." In War, ed. M. Fried, M. Harris, and R. Murphy, pp. 3-16. Garden City, N.Y.: Natural History Press. Source that my source quoted: Carniero R. (1990). "Chiefdom-Level Warfare as Exemplified in Fiji and the Cauca Valley." In The Anthropology of War, ed. J. Haas, pp. 190-211. New York: Cambridge University Press. Sources that my source quoted: For a first time period (1940-62) Knauft (1985) - Good company and violence: Sorcery and social action in a lowland New Guinea society. Berkeley:University of California Press. cites 778 violent deaths per 100,000 people per year. For a second time period (1959-68): Steadman (1971) - Neighbors and killers: Residence and dominance among the Hewa of New Guinea. Ph.D. diss., Australian National University, Canberra, Australia. cites 683 violent deaths per 100,000 people per year. I calculated the mean which is 731. Source that my source quoted: Hickerson, H. 1962. "The Souchwestern Chippewa: An Echnohistorical Study." American Anthropologist 64: Memoir 92. Source that my source quoted: Morren, G. 1984. "Warfare on the Highland Fringe of New Guinea: The Case of the Mountain Ok." In Warfare, Culture, and Environment, ed. R. Ferguson, pp. 169— 208. Orlando, Fla.: Academic Press. Source that my source quoted: Otterbein, K. (1967) - "The Evolution of Zulu Warfare." In Law and Warfare, ed. P. Bohannon, pp. 351-57. Garden City, N.Y.; Natural History Press. Source that my source quoted: Hallpike, Bloodshed and Vengeance in the Papuan Mountains, pp. 54, 202. Comment: Gat (2006) writes &apos;among the Goilala, whose total population was barely over 150, there were 29 (predominantly men) killed during a period of 35 years&apos;. I calculated the rate of violent deaths given assuming that the population was 150 (the lower bound of his estimate). Source that my source quoted: Heider, K. (1970) - The Dugum Dani. Chicago: Aldine. Source that my source quoted: Ray, V. (1963) - Primitive Pragmatists: The Modoc Indians of Northern California. Seattle: University of Washington Press. Source that my source quoted: Robbins, S. 1982. Auyana: Those Who Held onto Home. Seattle: University of Washington Press. Comment: Knauft et al (1987) give the same number but cites not Wright (1942) but Warner (1969:146-47) - A black civilization: A social study of an Australian tribe. New York: Peter Smith. Source that my source quoted: Hallpike, C. (1977) - Bloodshed and Vengeance in the Papuan Mountains. Oxford: Oxford University Press. Source that my source quoted: Meggitt (1977) - Blood Is Their Argument. Palo Alto, Calif.: Mayfield. Source that my source quoted: Early, J., and J. Peters. 1990. The Population Dynamics of the Mucajai Yanomamo. San Diego, Calif.: Academic Press. Source that my source quoted: Stewart, K. 1965. "Mohave Warfare." In 77jt? California Indians, ed. R. Heizer and M. Whipple, pp. 369-82. Berkeley: University of California Press. Comment and source that my source quoted: Knauft B (1985) Good Company and Violence. Berkeley. University of California Press. Knauft et al (1987) cite a violent death rate of 419 per 100,000 people per year. Source that my source quoted: Melancon (1982:33,42) - Marriage and reproduction among the Yanomamo Indians of Venezuela. Ann Arbor: University Microfilms. Source that my source quoted: Pilling, A. 1968. "Discussion: Predation and Warfare." ln Man the Hunter, ed. R. Lee and 1. Devore, p. 158. Chicago: Aldine Atherton. Source that my source quoted: Ploeg, A. 1983. "The Establishment of the Pax Neerlandica in the Bokondini Area." In The Pacification of Melanesia, ed. M. Rodman and M Cooper, pp. 161-78. Lanham, Md. : University Press of America. Source that my source quoted: Gat (2006) is referring to: Donald Symons, The Evolution of Human Sexuality. New York: Oxford University Press, 1979, p. 145; Bruce Knauft, ‘Reconsidering violence in simple societies: Homicide among the Gebusi of New Guinea’, Current Anthropology, 1987; 28: 458; Jean Briggs, ‘ “Why don’t you kill your baby brother?” The dynamics of peace in Canadian Inuit camps’, in L. E. Sponsel and T. Gregor (eds), The Anthropology of Peace and Nonviolence. London: Lynne Rienner, 1994, p.156. Source that my source quoted: Richard Lee, The !Kung San. New York: Cambridge University Press, 1979, p. 398. Comment: Quotation of Gat (2006): &apos;The rate for the !Kung Bushmen of the Kalahari, the famous ‘harmless people’, was 0.29 per 1,000 per year, and had been 0.42 before the coming of ﬁrm state authority&apos;. Source that my source quoted: Thieme, F. 1968. "The Biological Consequences of War." In War, ed. M. Fried, M. Harris, and R. Murphy, pp. 16—21. Garden City, N.Y.: Natural History Press. Source that my source quoted: Nash (1967) - Death as a way of life: The increasing resort to homicide in a Maya Indian community. American Anthropologist 66:1-19. Source that my source quoted: Lewis (1951 26-28, 227) - Life in a Mexican village: Tepoztlán restudied. Urbana: University of Illinois Press. Own calculation: I am following Pinker calculating this data: White (2011)15 estimates a total number of deaths of all violent deaths in the 20th-century of 180 million deaths. Pinker assumes an average annual world population for the 20th century of 3 billion. (see his footnote 65 in chapter 2). 180.000.000 / 100 = 1.800.000 violent deaths per year. Divided by an annual population of 3.000.000.000 and multiplied by 100,000 is 60. Own calculation: I am following Pinker calculating this data: From the US Census I know that the average population of the US over the 20th century was: 163,275,000 (The source for this data is U.S. Census. The number of &apos;Total Deaths of U.S. Military Personnel Serving and Casualties&apos; for the 20th century: 619,538 This is taken from Leland & Oboroceanu (2010)16. The sum of total deaths is: 619.538. That means in an average year of the 20th 6195.38 US citizens died in war. Therefore the number of war deaths per 100,000 of the US in the 20th century is 3.79 (including the deaths of US-Americans in the Spanish-American War in the 2 last years of the 19th century. Own calculation: I am following Pinker calculating this data: The Human Security Report Project. (accessed April 2013). Miniatlas of human security. (World Bank) has data on the global number of war deaths and is available online. The total sum of the above is: 22.139. The population of the earth in 2007 war 6.658.000.000 (World Bank). This means taking the whole planet together 0.33 of 100,000 people died in battles and one-sided violence. The following statistics refer to the share of violent deaths out of all deaths in a given society. Source that Gat (2006) quoted: J.A.Yost,‘Twenty years of contact: The mechanism of change in Wao (Auca) culture’, in N. A. Whitten (ed. ), Cultural Transformation and Ethnicity in Modern Ecuador. Urbana, IL: University of Illinois, 1981, pp. 677–704; C. A. Robarchek and C. J. Robarchek, ‘Cultures of war and peace: A comparative study of Waorani and Semai’, in J. Silverberg and J. P. Gray (eds), Aggression and Peacefulness in Humans and Other Primates. New York: Oxford University Press, pp. 189–213. Comment: Quote from Gat (2006): The tribe &apos;resembles the Yanomamo in their subsistence patterns and in the causes and style of ﬁghting&apos;. The data is collected over five generations &apos;60 % of adult deaths over ﬁve generations were caused by feuding and warfare&apos;. Source that my source quoted: Frank Livingstone, ‘The effects of warfare on the biology of the human species’, in M. Fried, M. Harris, and R. Murphy (eds), War: The anthropology of armed conflict and aggression. Garden City, NY: Natural History, 1967, p. 9, including other relevant statistics. Source that my source quoted: Werner, D. W. (1980). The making of a Mekranoti chief: The psychological and social determinants of leadership in a native South American Society. PhD dissertation. City University of New York, New York. Source that my source quoted: Meggitt, Blood is their Argument, pp. 13–14, 110. Source that my source quoted: Knauft (1985) - Ritual form and permutation in New Guinea: Implications of symbolic process for socio- political evolution. American Ethnologist 12:321-40. Comment: It is noted that the extraordinary high homicide rate for women might be explained by &apos;the fact that killing was mainly related to failure to reciprocate in sister exchange marriage&apos;. Source that my source quoted: Ross,J. 1984. "Effects of Contact on Revenge Hostilities Among the Achuarajivaro." In Warfare, Culture, and Environment, ed. R. Ferguson, pp. 83—110. Orlando, Fla.: Academic Press. Source that my source quoted: Heider, The Dugum Dani, p. 128. Source that my source quoted: Conklin, 1989 -- Conklin, B. A. (1989). Images of health, illness and death among the Wari&apos; (Pakaas Novos) of Rondonia, Brazil. PhD dissertation. University of California, San Francisco. Source that my source quoted: Boehm, Blood Revenge, p. 177. Source that my source quoted: Chagnon. 1974. Studying the Yanomamo. New York: Holt, Rinehart and Winston. Source that my source quoted: Bugos, P. E. Jr. (1985). An evolutionary ecological analysis of the social organization of the Ayoreo of the Northern Gran Chaco. PhD dissertation, Northwestern University, Evanston, IL. Comment: Based on 276 killings. Source that my source quoted: Meggitt - 1977. Blood Is Their Argument. Palo Alto, Calif.: Mayfield. Comment: Male Deaths: 34.8% - Female Deaths: 2.3%. Comment: 80% of the victims were male, total killings 10 out of 64 deaths. Source that my source quoted: Mildred Dickemann, ‘Female infanticide, reproductive strategies, and social stratification’, in N. Chagnon and W. Irons (eds), Evolutionary Biology and Human Social Behavior. North Scitnate, MA: Buxbury Press, 1979, p. 364; slightly different (and inconsistent) figures in: Marvin Harris (ed. ), ‘Primitive war’, in Cows, Pigs, Wars and Witches. New York: Random House, 1974, p. 69. Keeley (1996) and Walker & Bailey quote N. Chagnon &apos;Studying the Yanomamö&apos; (Holt, Rinehart and Winston, New York) (1974). For the male and female population Keeley (1996) quotes a share of violent deaths of 15.3%. Source that my source quoted: V. F. Ray, Primitive Pragmatists: The Modoc Indians of Northern California (University of Washington Press, Seattle, 1963), pp. Comment: Refers to “Aboriginal times”. Source that my source quoted: Glasse, R. 1968. Hull of Papua: A Cognathic Descent System. The Hague: Mouton. Society: (Hunter-Gatherer) Casiguran Agta (Philippines) Share of Violent Deaths: 12% were attributed to homicide (In the less violent time period (1962-1977); adult male population). Between 1977 and 1984 the homicide rate is 326 homicides per 100,000 people per year. In this time period, that was described as unusually violent (and which is therefore not quoted in my statistic) 21% of all adult male deaths were due to homicide (see comment). Original source: Headland, T. (1989) - Population decline in a Philippine Negrito hunter-gatherer Society. American Journal of Human Biology, 1, 59–72. Comment: The source of Pinker on the percentage of deaths in warfare is Bowles (2009) and he made a mistake that Fry (2013) corrects: Bowles (2009) based his calculation on ten killings when in fact 9 killings are reported. In the time between 1936 and 1950 not 10 but 9 Casiguran Agta were killed - 1 in 1950, 5 in 1947; 1 in1938 raid and 2 “shortly after World War II”. Bowles therefore miscalculated his data and Pinker carries this wrong number over. As Headlands study of the Agta focusses on a later time (1962-84) I take the data from this better researched time. As Headland states that the latter half of his research stay (post-1977) was a time of &apos;unusual high violence&apos; I quote the death rate due to violence from the earlier time (1962-77). In this more &apos;peaceful&apos; time the share of violent deaths was 12% (and this also is not counting the number of killings of non-Agta by Agta - which is also high (see below)). Homicides, as opposed to deaths in warfare are very common in the Agta Population as Headland points out: &apos;In the sample of adult male deaths before 1977, 12% were attributed to homicide; in 1977-1984, 21% of all adult male deaths were from homicide. The overall homicide rate for the Casiguran Agta, based on the data for 1977-1984, is 326 homicides per 100,000 people per year. The 14 homicides on which this calculation is based include only homicides of members of the de jure population.&apos; (page 68). Source that my source quoted: Huber, P. 1973. "Defending the Cosmos: Violence and Social Order Among the Anggor of New Guinea." In War, Its Causes and Correlates, ed. M. Nettieship, R. Givens, and A. Nettieship, pp. 619-61. The Hague: Mouton. My source for the data: Hill,K.,Hurtado,A.M.,&Walker,R.S.(2007). High adult mortality among Hiwi hunter-gatherers: Implications for human evolution. Journal of Human Evolution, 52, 443–454. The numbers I quoted and the share of violent deaths is not counting infanticides that were very common among the Hiwi (and are reported by Hill, Hurtado (2007)). Comment and Source that my source quotes: Gat (2006) quotes death rates from Pilling and Kimber and refers to three different sources: Warner, A Black Civilization, pp. 157–8; Pilling, in Man the Hunter, p. 158; R. G. Kimber, ‘Hunter-gatherer demography: The recent past in Central Australia’, in B. Meehan and N. White (eds), Hunter-Gatherer Demography. Sydney: University of Sydney, 1990, p. 163. Gat (2006) refers to Kimber saying: &apos;Kimber’s estimate, for a generation, of 5 per cent mortality in ﬁghting in arid areas and about 6.5 per cent in well-watered ones refers to violent mortality in relation to the entire population’s overall mortality rates.&apos; Pinker quotes the 10%, which according to Gat (2006) only refers to the male population. I decided to quote the average of the two shares specified for the entire population. That is 5.75%. Source that my source quoted: L. R. Hiatt, Kinship and Conflict: A Study of an Aboriginal community in Northern Arnhem Land (Australian National University, Canbera, 1965), pp. Source that my source quoted: Harris 1975. Culture, People, Nature. 2d ed. New York: Crowed. The world population in 2007 was 6.658.000.000 (World Bank) - The death rate of the world is approximately 8 per 1000 per year according to the CIA Factbook. This means in 2007 around 53264000 people died in 2007. Therefore the ratio of people dying due to warfare in 2007 is 22139/53264000. This means 0.04% of the global deaths were due to warfare in 2007. Comment and sources: Bowles (2009) quotes F. Wendorf, in The Prehistory of Nubia F. Wendorf, Ed. (Southern Methodist University Press, Dallas, 1968), vol. 2, pp. 954-998. Keeley (1996) cites Wendorf (1968) - &apos;Site 117: A Nubian Final Palaeolithic Graveyard near Jebel Sahaba, Sudan.&apos; In The Prehistory of Nubia, vol. 2, ed. F. Wendorf, pp. 954-95. Dallas: Southern Methodist University Press. Keeley refers to a time 10,000 B.C and quotes a share of violent deaths of 40.7%. Source that my source quoted: Cybulski, J. (1994) "Culture Change, Demographic History, and Health and Disease on Che Northwest Coast" In In the Wake of Contact, ed. G. Milner and C. Larsen. New York: Wiley-Liss. Source that my source quoted: G. R. Sharma, Proceedings of the Prehistoric Society 39, 129 (1973). Comment: Here Pinker appears to have made a mistake by converting the dates from years before present to BCE/CE. Bowles gives the time period as &apos;3140-2854 years before present&apos; which Pinker erroneously converted to 2140-850 BCE. Source that my source quoted: Cybulski (1994) - J. Cybulski, in In the wake of contact: Biological responses to conquest C. S. Larsen, G. Milner, Eds. (Wiley-Liss, 1994) pp. 75-85. Source that my source quoted: Livingstone, ‘The effects of warfare on the biology of the human species’, p. 9. Source that my source quoted: V. N. Danilenko, Sovietskaya Etnografia 3, 54 (1955). *Comment: Pinker (2011) dates this to &apos;±7500BCE&apos;. Source that my source quoted: Telegin, D. (1961) Arkheologiya XIII, 3. Comment Keeley (1996) has data on &apos;Ukraine: Vasylivka (Mesolithic)&apos; and quotes Vencl 1991. "Interprétation des Blessures Causée par les Armes au Mésolithique" L&apos;Anthropologie 95: 219-28. as his source. He gives a share of violent deaths of 15.9%. Source that my source quoted: Wendorf, F. 1968. "Site 117: A Nubian Final Palaeolithic Graveyard near Jebel Sahaba, Sudan." In The Prehistory ofNubia, vol. 2, ed. F. Wendorf, pp. 954-95. Dallas: Southern Methodist University Press. Source that my source quoted: Milner, G, E. Anderson, and V. Smith. 1991. "Warfare in Late Prehistoric West-Central Illinois." American Antiquity 56: 581-603. Gat (2006) quotes a share of violent deaths of 16%. Source that my source quoted: Willey, P . 1990. Prehistoric Warfare on the Great Plains. New York: Garland. Source that my source quoted: Price, T. D. 1985. "Affluent Foragers of Mesolithic Southern Scandinavia." In Prehistoric Hunter-Gatherers, ed. T. Price and J. Brown, pp. 361-64. Orlando, Fla.: Academic Press. Source that my source quoted: R. R. Newell, T. S. Constandse-Westerman, C. Meikeljohn, Journal of Human Evolution 8, 29 (1979). Source that my source quoted: Walker, P., and P, Lambert 1989. "Skeletal Evidence for Stress During a Period of Cultural Change in Prehistoric California." In Advances in Paleopathology, Journal of Paleopathology: Monographic Publ. no. 1, ed. L. Cappasso, pp. 207-12. Chieti, Italy: Marino Solfanelli. Source that my source quoted: Vencl 1991. "Interprétation des Blessures Causée par les Armes au Mésolithique" L&apos;Anthropologie 95: 219-28. Source that my source quoted: V. Andrushko, K. Latham, D. Grady, A. Pastron, P. Walker, American Journal of Physical Anthropology 127, 375 (2005). Source that my source quoted: T. D. Price, in Prehistoric Hunter-Gatherers: The emergence of cultural complexity T. D. Price, J. A. Brown, Eds. (Academic, Orlando, 1985) pp. 341- 363. Comment: Keeley (1996) cites Price, T . D., and J. Brown, eds. 1985. Prehistoric Hunter-Gatherers. Orlando, Fla.: Academic Press. and gives a share of violent deaths of 3.8%. Source that my source quoted: P. Lambert, in Troubled Times: Violence and Warfare in the Past D. L. Martin, D. W. Frayer, Eds. (Gordon and Breach, Amsterdam, 1997) pp. 77-109. Source that my source quoted: Webb, W. 1974. Indian Knoll Knoxville: University of Tennessee. Source that my source quoted: Moratto M. (1984) - California Archaeology. Orlando, Fla.: Academic Press. Source that my source quoted: R. D. Jurmain, American Journal of Physical Anthropology 115, 13 (2001). Comment: Here Pinker appears to have made a mistake by converting the dates from years before present to BCE/CE. Bowles gives the time period as &apos;2240-238 years before present&apos; which Pinker erroneously converted to 240 - 1770 CE. Source that my source quoted: M.-C. Chamla, Memoires du Centre de Recherches Anthropologiques, Prehistoriques, et Ethnographiques XV, 1 (1970). Source that my source quoted: F. Wendorf, in The Prehistory of Nubia F. Wendorf, Ed. (Southern Methodist University Press, Dallas, 1968), vol. 2, pp. 954-998. Source that my source quoted: P. Sereno et al., PLoS ONE 3, 1 (2008). Comment: Based on 35 of the approximately 200 burials at the site. All my sources for this bar chart (and all other ethnographic and archaeological evidence in this entry) are presented further down in this document in the data sources section. All sources for this table (and all other ethnographic and archaeological evidence in this entry) are presented further down in this document here. All sources for this table (and all other ethnographic and archaeological evidence in this entry) are presented further down in this document – here. Mueller (2009) - War Has Almost Ceased to Exist: An Assessment. In Political Science Quarterly, 124, 2, 297--321. Fry (2013) - Chapter 1: War, Peace, and Human Nature. The Challenge of Scientific Objectivity. In War, Peace, and Human Nature: The Convergence of Evolutionary and Cultural Views. Edited by Douglas Fry. Oxford University Press. New York. White, M. (2011). The great big book of horrible things. The definitive chronicle of history’s 100 worst atrocities. New York: Norton.